Just throwing up my first mock of the season. I am sure there are some things that aren't for everyone, but I am gonna try to be somewhat realistic. Much of my focus in this off season though is to help out Sam as much as possible. That really should be the main thing we are thinking about when constructing next years roster. Isaiah Crowell: Just to streaky and doesn't make enough happen on his own. Cutting him saves us 3 mill. After the cuts we are sitting at 111.3 Mill. Trey Flowers DE/OLBer: The Pats only have 20 mill in cap space next year, and I think that they think they can get it done with just about anyone. Flowers has played well and will demand some money especially considering his age. Flowers gets 12 mill per which is more than the Pats are willing to part with. Brandon Graham DE/OLBer: A bit older of a free agent but has still been an effective player. Gives us a 2nd edge guy that can pressure the QB. Comes at a slightly better price due to being 31. Graham gets 8 mill per. Ronald Darby CB: We need another CB. Part of me wants to let the guys on the roster battle it out for the number 2 spot, but instead we sign a young guy who has played fairly well thus far in his career. Darby gets 13 mill per. After this moderate spending spree we are left with 36.3 mill in space. Honestly it would probably be more because teams never take the full per year cap hit in year one but i did just to be conservative. #1 Cards: They take Bosa and don't overthink it. #2 49ers: Josh Allen- comes off the board, he fits what they need pretty spot on. #3 pick is traded to the Broncos who move up to take Drew Lock. Jets receive #10, #42, #71, and 2020 1st rounder. Denver has to make their move at some point. The rest of the team has some talent but they have been dealing with terrible QB play since Peyton. #10 Jets: D.K Metcalf WR- Here it is. This is the pick that will decide if you love or hate this mock. I personally think D.K has top 5-10 WR in the league potential. I think he runs far better routes than he is given credit for. Has crazy top end speed (was clocked over 22 mph in practices recently), is huge, strong, has great hands even during contested catches. Most importantly though, he shreds press coverage, can find soft spots in zones, and has elite acceleration especially for his size. Him and Robby on the outside and Q as our big slot will make Sam's life much easier. #42 Jets: Ben Powers OG- Guy really impressed me at the senior bowl. Has good size, 315, and a powerful anchor, but was asked to play in a spread system at Oklahoma which meant he had to have good feet and move well to the 2nd level. He slots in between Morse and Brown as our LG. #68 Jets: Daylon Mack DT- This dude is THICK. And really impressed me at the senior bowl. We need someone who can make teams pay for double teaming Leo in the middle.... Daylon might be that guy. 6-1 325 he is nothing but power, but against 1 guy he is just going to walk him back to the QB. #93 Jets: Andy Isabella WR- I think his size and propensity for body catching drops him to us here. But he has elite burst and speed, and knows how to get open on horizontal cuts. He also becomes our return guy right away and our #4 WR. #98 Jets: Rodney Anderson RB- I know we signed Bell, but part of the reason Bell was losing his mind in Pitt was that they were slowly trying to murder him with his work load. Anderson falls here due to his injury this year, but I really think this could be the steal of the entire draft. He might be the most complete back in the draft this year. I see a ton of him and Bell on the field at the same time with Bell motioning out to the slot or out wide to tool on LBers and safties. #130 Jets: Oli Udoh OT- So no this isn't a draft pick to be an immediate starter, but he is a big, athletic guy who has the physical skills to play probably 4 positions on the line. Came from a small school, Elon, but held his own at the shrine game and the senior bowl. Give him a year or 2 with some solid NFL coaching and we might have a guy that can take over at RG or RT if Winters or Shell don't show something going forward. Then we take someone in the 7th lol not sure who. No way the Jets walk away from the draft with two D guy being picked. 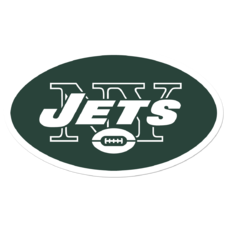 History has shown that the Jets love to draft D players early and often. Id love this draft an offseason. Which means it wont happen anything like this. Nice mock. I like the trade back and DK Metcalf pick. I also like doubling down on WR. This class is pretty deep. It won’t matter because we’ll have money to spare, but I think your contracts for Flowers and Graham are a little light. Sport race has both those guys in the mid teens which seems more reasonable to expect. Graham will likely get less years. That’s a haul you have us getting from Denver. Hopefully we get something close to that. Ya I left the buffer money in case some of the contracts were light, but I also gave them the full cap hit in the first year, which never happens. On the trade value. To move from 6 to 3 last year we gave up 2 2nds that year and a 2nd this year which counts as a 3rd for valuation. Denver is moving 4 extra spots and would be giving up a 2nd, a 1st next year which counts as a 2nd valuation wise and a 3rd... it is identical to what we gave up relative value wise and we moved 4 less spots. Agree. Your free agency is really good. Can’t wait for March. I guess it depends on how much a GM values a future first. Should be interesting to see what we get. I do feel a trade down with the Broncos is a real possibility. Elway can’t afford to keep trotting out bad QBs. I believe the Case Keenum experiment has run its course lol.